With that being said, Danny DeVito played an awesome Penguin. 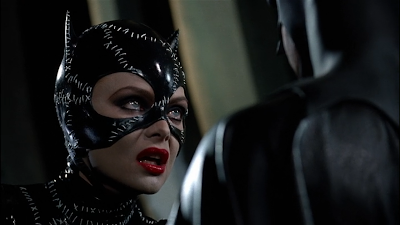 Michelle Pfeiffer was a crazy Catwoman (meow! ), Christopher Walken did a great job as Max Shreck, and Michael Keaton was a cool Batman. 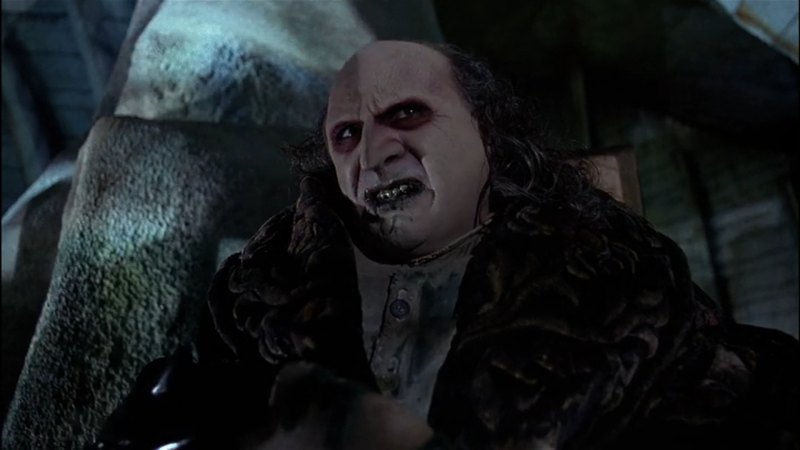 Actually, my favorite part about this movie was Danny DeVito as the Penguin. In particular, he's the focus of my favorite scene in the movie. Aside from that, I also enjoyed the spicy relationship between Batman and Catwoman. 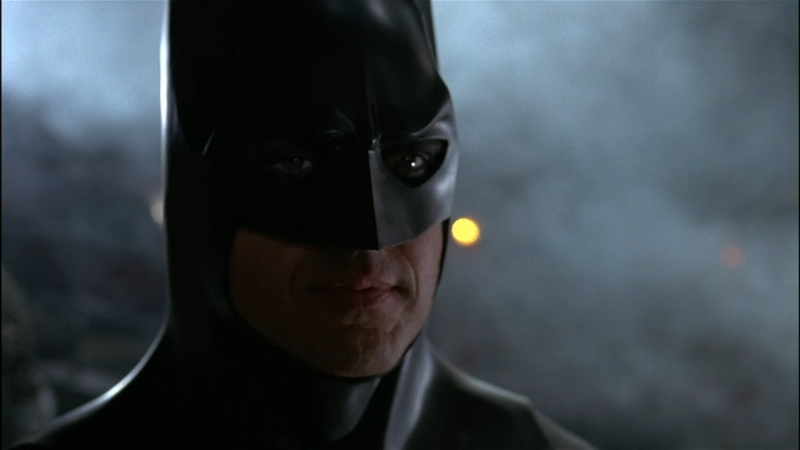 This movie, while not visually striking like Batman Begins (2005) or Dark Knight, had its own sort of beauty. 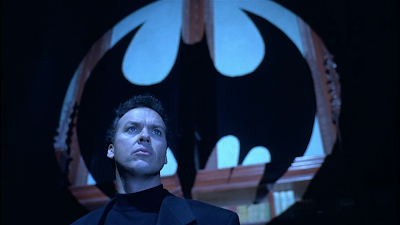 Overall, I enjoyed Tim Burton's Batman. 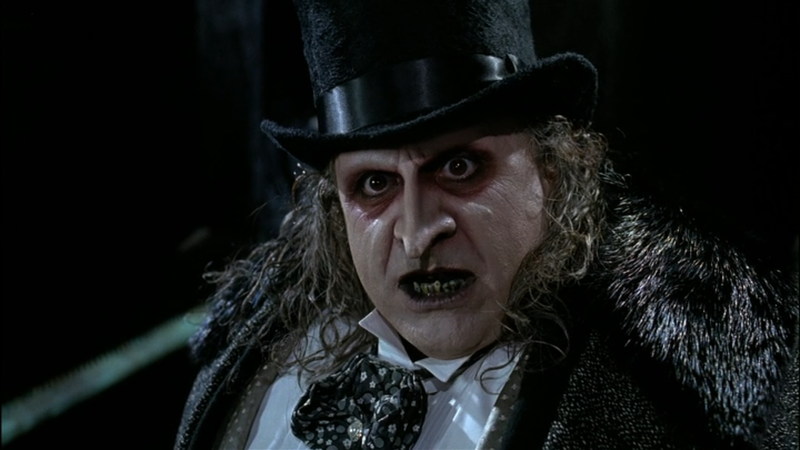 The last time I watched this movie, I caught it about 23 minutes in, when the Penguin first kidnaps Shreck. I had also missed how Catwoman became Catwoman. Apparently a lot takes place in the first 23 minutes. In any case, it wasn't until the Penguin's parents brought the baby to the river that I had asked Caroline if we were watching Batman. Up until then I was totally in the dark. With that being said, the very first 10 or 20 seconds had Tim Burton's name written all over it. In fact, I thought to myself myself, "Am I watching 'Corpse Bride'?" But I quickly dismissed the idea, because I could tell the movie wasn't animated. Then when I saw the parents, I also got the feeling I was watching a Tim Burton movie. Good ol' Tim Burton. Watching the entire movie (including credits) made for a much better experience than my previous viewing (which was already a great experience). As of 20180120, Netflix determined the movie for me as a 96% match. I decided to give the movie neither a thumbs down nor a thumbs up. 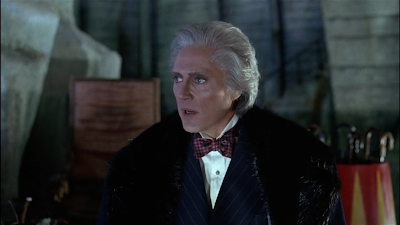 2: I hadn't realized Christopher Walken was Max Shreck until Caroline emphasized his name during the opening titles. 2: This opening scene was great. A: A mix between real and fake penguins. 1: Penguin's umbrella being used as a helicopter. I guess some things are harder to believe when portrayed in live action versus when portrayed in animation. A: "Saved by kitty litter." Bruce receives the Bat Signal. 2: The movie listed the cast members near the end of the credits instead of at the beginning. Selina begins fashioning her Catwoman outfit.